Sharing the highlights of our recent trip to California, including a visit to Shabby Chic Couture in Santa Monica! Hello everyone! 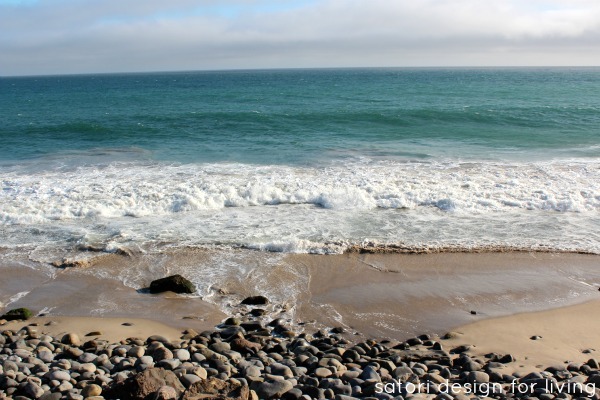 Yesterday I returned from an extended weekend getaway to California’s Pacific Coast. It’s a trip we take at least once a year that coincides with my husband’s travel requirements for work. You can read about last year’s California adventure here. 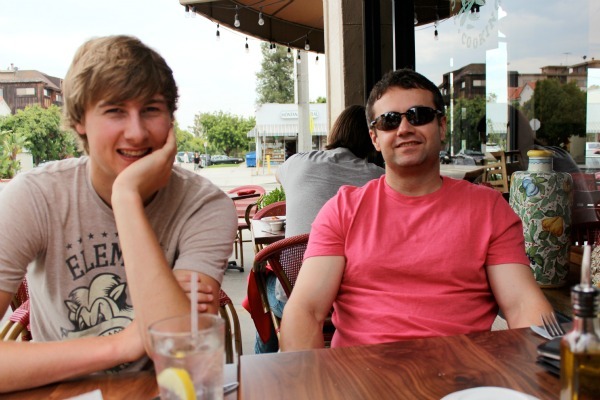 This time we decided to spend a night in Santa Monica and head over to Long Beach for a few days. The weather was fantastic, but the head cold that took my voice and a lot of my energy was terrible timing. However, it didn’t stop me from site-seeing, taking in some good eats, a little rest and relaxation poolside, and, of course, shopping! Although I’ve been to Santa Monica a couple times before, I’ve never had the opportunity to do any shopping. This time I had at least one destination store on my list, and all I had to do was entice my boys with a little lunch (works every time!). For those of you who are interior decorating enthusiasts, you’re probably familiar with Rachel Ashwell and her distinct shabby chic style. I became a huge fan back in the 90’s, and I love how she’s continually updated the style to keep it looking fresh. Santa Monica is where Rachel opened her first Shabby Chic shop back in 1989, selling machine washable slipcovered furniture and vintage finds. Today, there is a location on Montana Avenue (where we visited), as well as four other flagship stores located in San Francisco, New York, London, and Texas. What stood out to us about the store is how each vintage piece looked like it was carefully selected and told a story. 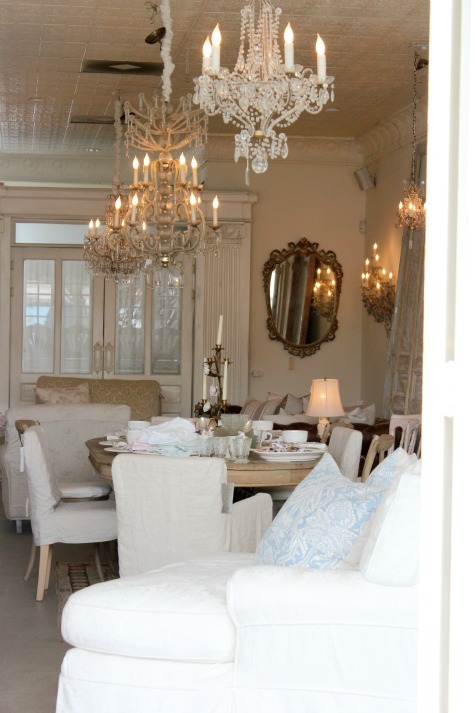 The chandeliers were magnificent and would be the perfect way to add character to any space. Oh how I wanted to bring one home with me! 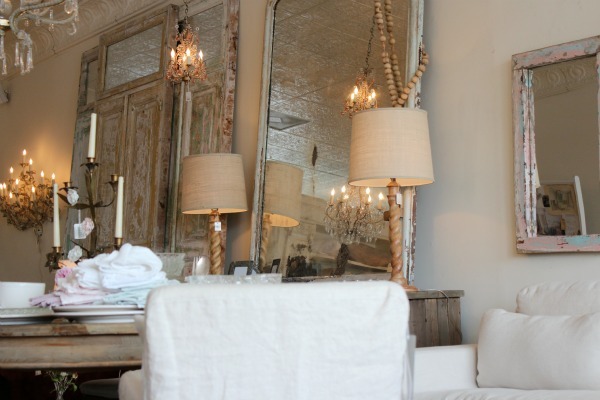 And what about these gorgeous vintage doors and mirrors… So charming! I also loved how comfortable all the beds looked (especially since I was feeling under the weather). It took everything in me not to climb into one! And finally, wouldn’t these vintage dishes, trays or textiles add a hit of “grandma chic” to a kitchen or dining space? Mixing a bit of old with the new always adds an interesting layer. 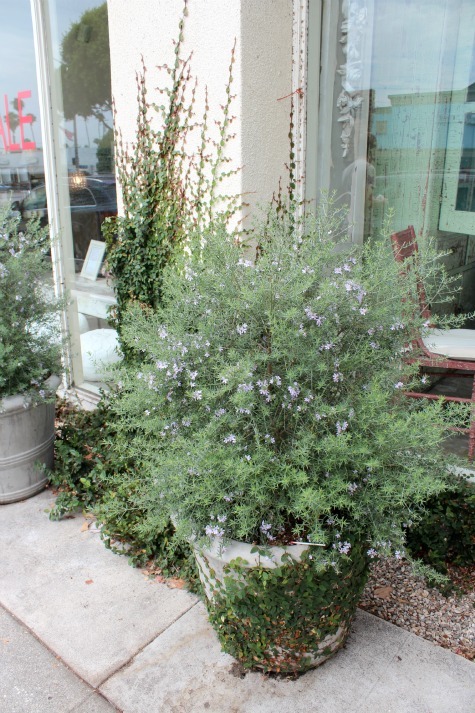 Visited Rachel’s Shabby Chic Couture shop in Santa Monica or any others in your travels? What stands out most to you about this style? Looks like you had a wonderful vacation Shauna – that beach looked sooo beautiful! 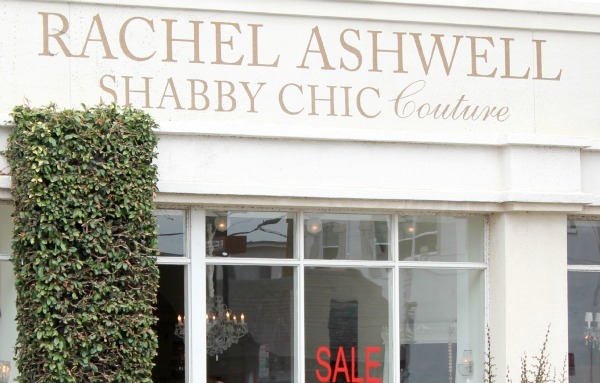 That must have been wonderful to visit Rachel Ashwells store (although you weren’t feeling so well…), I’ve been a fan of her for so long now! Did you buy anything there? I didn’t buy anything this time, but I will definitely be making a trip back once we have our cottage. The bedding is beautiful and luxurious! I really appreciate her style, and am with you – what keeps me coming back for more is that she keeps it feeling fresh and updated without losing her own touch! It looks like a really cool store! 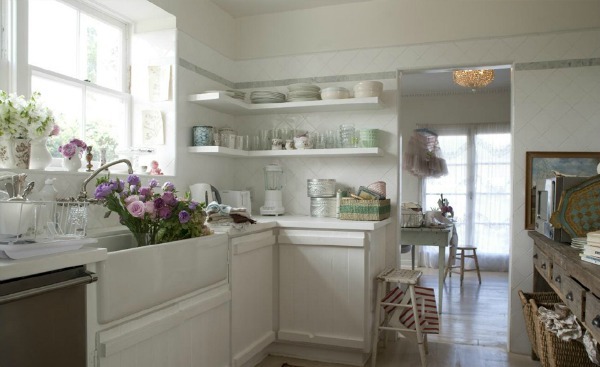 I think there is a fine line sometimes between Shabby Chic and ‘Country’ but her stuff looks great. Totally agree. Small doses or it can go too country. What a great vacation. I could live in a store like that…or I could buy everything and live in my house with the stuff. So beautiful. It was fun checking it out and bringing home some new inspiration. The style was very comfortable. Sounds like you had a great vacation. Love all your pics! Thanks Dani! It was really fun! Lovely! I have friends who live in Seaside, CA. The pace is so great out there. (Plus, the food and wine are amazing… but maybe it’s just the vacation talking). 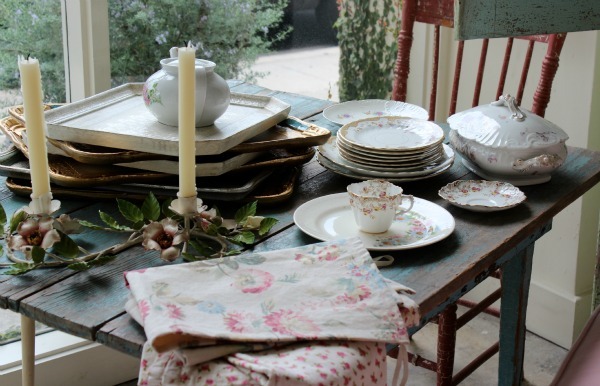 The Shabby Chic look is beautiful — relaxed and refined at the same time. Being sick, I ate a lot of soup, but my boys tried all sorts of great food. They know how to do fresh. Thanks for taking a break from your bathroom reno to stop by! I was a huge fan of Rachel Ashwell back in the day and I’m glad to see her look and brand looks current today.. Even though i like things a tad bit more modern these days, her bedding always looks so inviting! Too bad you were feeling poorly for this trip but it looks like you enjoyed it anyway..